The Walt Disney Co. announced Thursday that Rian Johnson will craft a new trilogy for the “Star Wars” universe, greatly expanding the director’s command over the ever-expanding space saga created by George Lucas. The announcement, made by Disney chief Bob Iger on a call with investment analysts, constituted the most ambitious new foray into the “Star Wars” galaxy, moving well beyond the original nine-film framework imagined by Lucas. 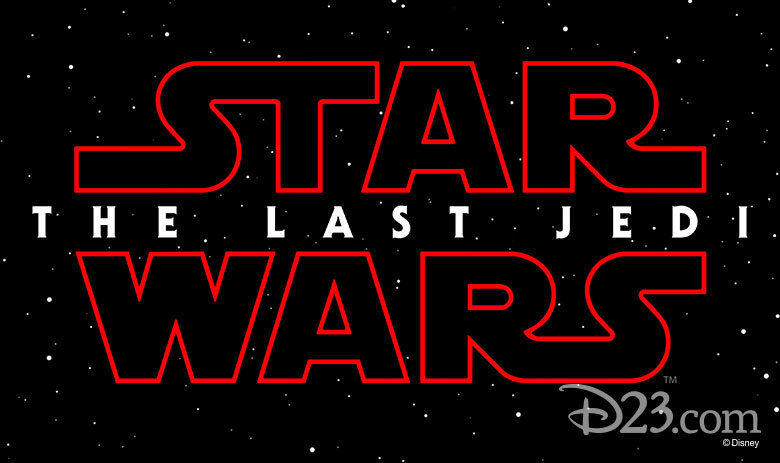 Disney also announced a live-action “Star Wars” series that will debut on its streaming service which is set to launch in 2019. The new films will be separate from the Skywalker saga. “Johnson will introduce new characters from a corner of the galaxy that Star Wars lore has never before explored,” Disney said in a statement. That Johnson will preside over a new “Star Wars” trilogy altogether confirms his status as the franchise’s new chief guardian. It’s a considerable amount of trust to be placed in the 43-year-old director of 2012′s “Looper,” even before audiences see his first “Star Wars” installment. J.J. Abrams, who kick-started the dormant franchise with “The Force Awakens,” is set to return for the untitled Episode IX — the third film in the current trilogy. Johnson will write and direct the first film in the trilogy, working with his producing partner Ram Bergman. Iger also revealed that Disney is also planning series for its streaming service based on the 2011 Pixar film “Monsters Inc.” and the Disney Channel movie franchise “High School Musical.” Iger said he expects the service to be priced “substantially below” Netflix’s $10-a-month subscription price. The Oscar-nominated director behind Billy Elliot and The Hours is in early talks to direct a Star Wars stand-alone movie centering on Obi-Wan Kenobi, The Hollywood Reporter has learned. Sources say talks are at the earliest of stages and that the project has no script. If a deal makes, Daldry would oversee the development and writing with Lucasfilm brass. The Obi-Wan Kenobi stand-alone is one of several projects being developed by Lucasfilm and Disney that fall outside the trilogies telling the saga of the Skywalker family. A Han Solo movie is now in the final stages of shooting under new director Ron Howard, and Lucasfilm is also considering movies centering on Yoda and bounty hunter Boba Fett, among other characters. In the original Star Wars trilogy, Kenobi is a desert-dwelling and war-weary hermit who later proves to be a wise and powerful warrior, brandishing a lightsaber. He is briefly a mentor to a young Luke before being cut down by Darth Vader, his former pupil. Alec Guinness’ portrayal of Kenobi garnered him an Oscar nomination. The character played a central role in the George Lucas-directed prequels, which recount the origin of Vader and his betrayal of Kenobi and the Jedis. McGregor, who played the younger Kenobi in the prequels, has said he would be open to playing the character again. Sources stress, however, that since there is no script, no actor is attached. He most recently directed episodes of Netflix’s period drama The Crown, which garnered him an Emmy nomination. Hollywood’s biggest names in acting and directing… Surprises at every turn… Compelling stories and sneak peeks that had us on the edge of our seats. 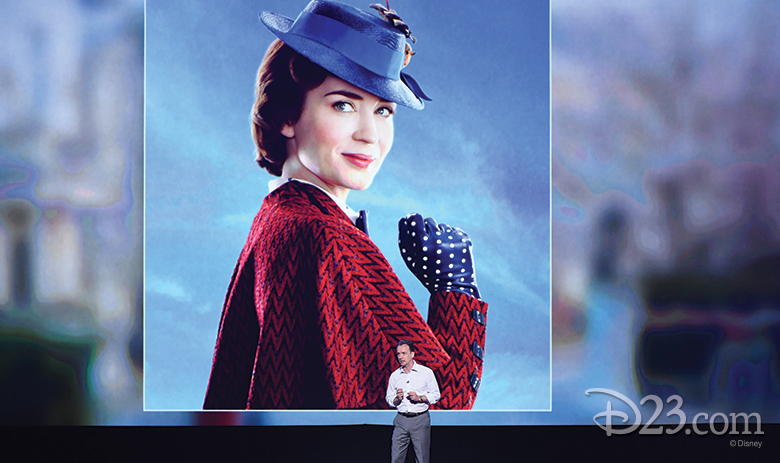 The Hall D23 presentation from The Walt Disney Studios this morning at D23 Expo featured all of these and more! Sure, fans were excited to learn they’d be going home with a teaser poster for The Walt Disney Studios’ upcoming film A Wrinkle in Time, which opens in theaters on March 9, 2018. But to be told that news by brand-new Disney Legend Oprah Winfrey only made the gift that much more exciting. Winfrey (who plays Mrs. Which) joined director Ava DuVernay and co-stars Reese Witherspoon (Mrs. Whatsit), Mindy Kaling (Mrs. Who), Chris Pine (Mr. Murry), and newcomer Storm Reid (Meg Murry) in Hall D23. The epic adventure is based on Madeleine L’Engle’s classic novel, which takes audiences across dimensions of time and space, examining the nature of darkness versus light and ultimately, the triumph of love. Sean Bailey, president of Walt Disney Studios Motion Picture Production, introduced us to The Nutcracker and the Four Realms, acclaimed director Lasse Hallström’s spin on a story that has been beloved for generations. The film, which will be in theaters on November 2, 2018, stars Keira Knightley, Helen Mirren, Mackenzie Foy and Richard E. Grant, as well as Morgan Freeman in the iconic role of Drosselmeyer. Music and dance are essential to the film, Bailey stressed, and he revealed that the incredible stylings of Charles Riley, known as Lil Buck (picture below), are being used to create the film’s Mouse King. The character will be made up of thousands of mice, made possible through cutting-edge CG, Bailey said. Expo guests were treated to a special performance by Lil Buck that gave us a glimpse into the hypnotic, fluid dance style we’ll see from the Mouse King when the film opens next year. The film was shot on location in London—which Marshall characterized as a special experience—and he said that audiences will recognize Cherry Tree Lane immediately. They might also recognize a piece of furniture, Marshall noted, sharing a photo of a table that’s part of the set for Mary Poppins Returns that also appeared in the original film. Leaving fans with “a little something”—an understatement—composer Marc Shaiman led an orchestra in a performance of a piece of the original score, which played over a series of images from the film. It was a supercalifragilistic-Expo-alidocious moment, if ever there were one. 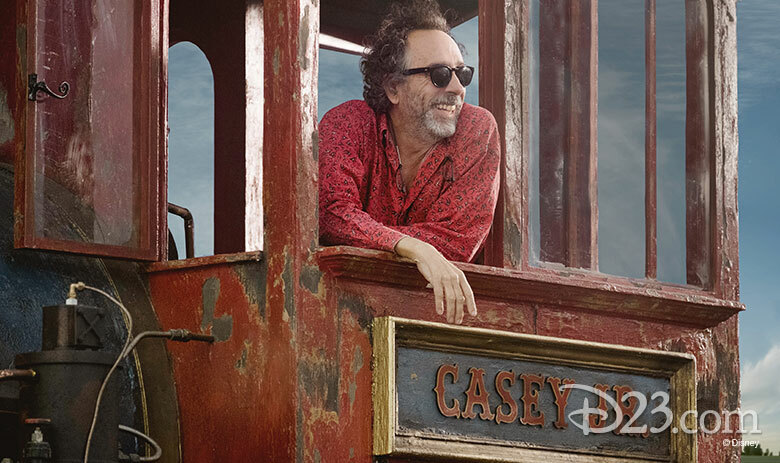 Director Tim Burton sent a greeting to Disney fans from the set of Dumbo, which is currently in production in London. Additionally, Bailey showed fans a maquette that was created to help bring the beloved baby elephant to life via state-of-the-art visual effects. The film stars Golden Globe® winner Colin Farrell (Saving Mr. Banks), Golden Globe winner Michael Keaton (Birdman, Beetlejuice), Emmy® and Golden Globe winner Danny DeVito (Batman Returns, Big Fish), BAFTA Award winner and Golden Globe nominee Eva Green (Miss Peregrine’s Home for Peculiar Children, Dark Shadows), and introduces Nico Parker and Finley Hobbins in their first film roles. Dumbo is slated for release on March 29, 2019. The Lion King Looks Amazing! 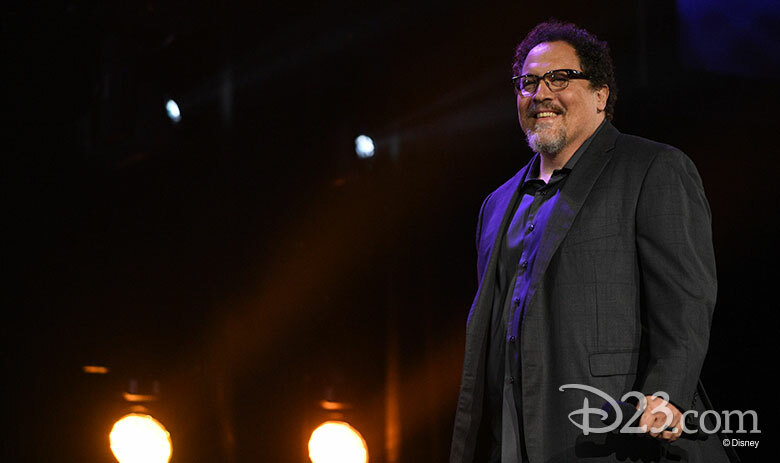 The Walt Disney Studios presentation at D23 Expo 2015 gave Disney fans a first look at The Jungle Book, directed by Jon Favreau, who was on hand again this year and received a standing ovation after showing footage from the upcoming live-action The Lion King. The photoreal interpretation of the film’s “Circle of Life” sequence featured beloved characters, including Rafiki, Mufasa, and an impossibly adorable baby Simba. Favreau, a lifelong Disney fan himself, told the excited crowd, “We like to check in with you.” His first question upon embarking on the film was, “When’s D23? We wanted to give you the first look.” The film is slated for release in 2019. 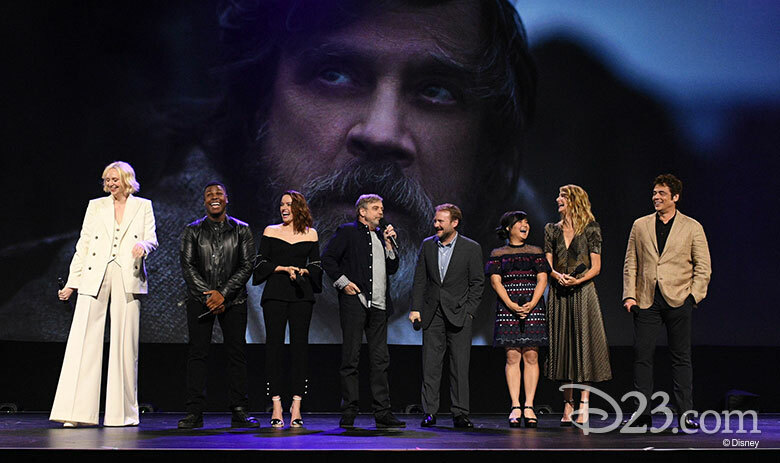 Star Wars: The Last Jedi director Rian Johnson took the stage at his first D23 Expo today, revealing that he began his career at Disney Channel, working in on-air promotions. As much as he loved that job, he says that making Star Wars: The Last Jedi has been the time of his life. Johnson and the cast then offered up a behind-the-scenes look at Star Wars: The Last Jedi, which opens in theaters on December 15, 2017. Kevin Feige is Marvel Studios President—and he’s also a massive Disney fan and a card-carrying D23 charter member who has been coming to D23 Expo since the first Expo in 2009. Feige explained that next year will be one of celebration—in honor of the 10th anniversary of Marvel Studios. It’s going to be a big year for the studio, and fans can look forward to what Feige calls “the biggest production in the Marvel Cinematic Universe—Avengers: Infinity War. The film is filming now, Feige said, but a slew of Super Heroes—and a fearsome villain—were able to take time away from the production to surprise Disney fans at Expo. 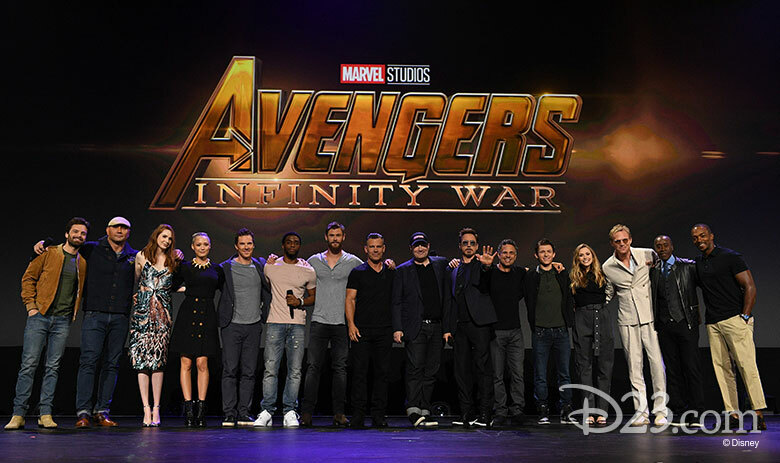 In the most Marvel-ous gathering of stars ever, Feige welcomed Robert Downey Jr., Chris Hemsworth, Mark Ruffalo, Anthony Mackie, Elizabeth Olsen, Paul Bettany, Benedict Cumberbatch, Tom Holland, Chadwick Boseman, Josh Brolin, Don Cheadle, Sebastian Stan, Dave Bautista, Karen Gillan, and Pom Klementieff to the stage, along with one of the film’s directors, Joe Russo. “Even I find myself geeking out,” Feige joked, as the assemblage continued. The crowd was on their feet long before Robert Downey Jr. demanded, “Let’s see it”—“it” being an exclusive early look at footage from the movie. Marvel Studios’ Avengers: Infinity War, an unprecedented cinematic journey 10 years in the making and spanning the entire Marvel Cinematic Universe, opens in theaters on May 4, 2018. In addition, the fifth chapter of the Indiana Jones series is now confirmed for a July 10, 2020 release. Both Steven Spielberg, director of every Indiana Jonesfilm, and star Harrison Ford will return. Walt Disney Co and major retailers will release the galaxy’s newest “Star Wars” toys at a September 1st midnight event ahead of the holiday debut of the next film in the saga, “The Last Jedi,” company executives told Reuters. Force Friday II will begin just after midnight on September 1st. Lego, Hasbro and others will release the first toys, apparel, books and other products tied to “The Last Jedi,” both online and in stores at retailers including Wal-Mart Stores Inc, Target, Toys R Us, Kohl’s, Amazon.com Inc and Disney Stores.